This marvelous restaurant is one of my new favorite East Bay restaurants, Michelin recommended, and a prime example of 5-star dining. Under the guidance of owners Rodney Worth and his wife Natalie, the menu is dynamic, the food is unique in flavor, the ambience is lovely, and the service is impeccable. There is a gorgeous outdoor seating area that offers a quiet, peaceful, romantic setting. However, we opted to sit inside at a beautiful window table due to cool weather conditions. The wait staff is very knowledgeable and friendly and the seasonal menus are diverse with options for everyone, including those on a limited diet (i.e. vegetarian, gluten-free, etc.) I appreciate that the wine list was plentiful in options both local and international, including wines from Europe and South America. The by-the-glass selections were equally extensive, offering many varietal choices. 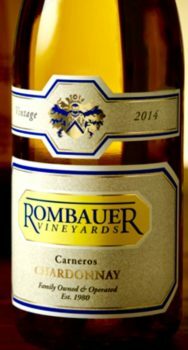 While the Spiced Pear Martini received rave reviews, we decided upon a bottle of Rombauer Chardonnay to accompany us through our navigation of the expansive and delectable lunch menu. As the name references, many of the dishes are prepared to include pears, which I happen to adore. For example, their menu features a pear quesadilla, fondue with pears, Bishop Ranch salad with pears, roasted pear pizza, and a smoked chicken sandwich with pears, just to list a few. After much deliberation, we decided upon the following menu items. 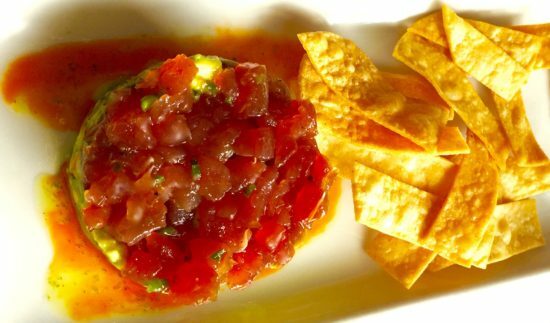 We began our gastric experience with the Baja Poke Tower featuring ahi tuna, avocado, cherry tomatoes, jalapeño, cilantro and accents with fresh lime, served with tortilla chips. It was a brilliant juxtaposition of creamy and mildly spicy, while the zing of the lime made it perfectly tart, yet sweet as a result of the cherry tomatoes. 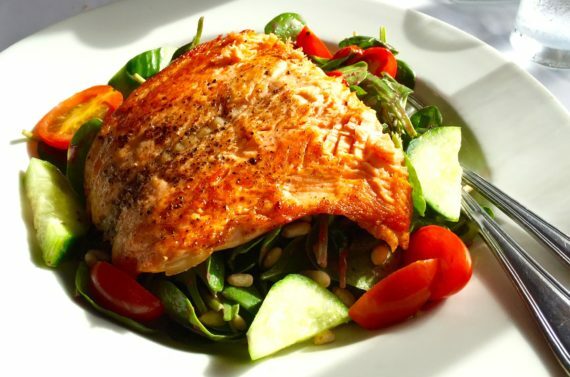 Our last course was the Mediterranean Salad, which consisted of pan seared pacific salmon, piquillo peppers, cucumber, cherry tomatoes, pine nuts and mint on baby spinach with pomegranate vinaigrette. The fish was perfectly cooked with a crispy outer texture, yet moist and flavorful inside. The seasonings were fantastic and the portion of fish was very generous in size. After our amazing meal, we took our time sipping the last of the buttery wine, followed by a deliciously rich espresso. 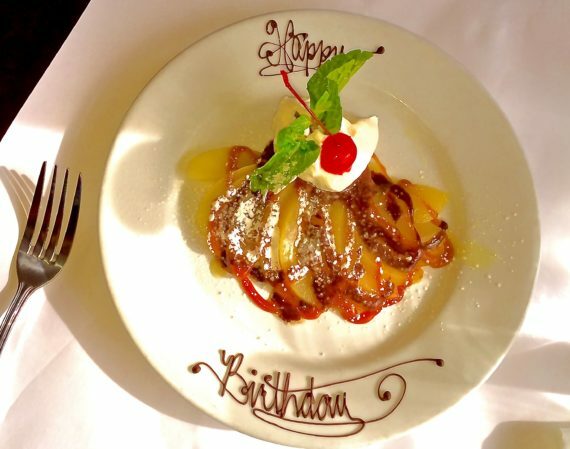 Just after delivering our coffee order, our fabulous waitress returned, surprising us with a lovely pear dessert after overhearing we were celebrating a birthday. What an absolute treat! We found The Peasant & The Pear to be an excellent fine dining experience in downtown Danville. 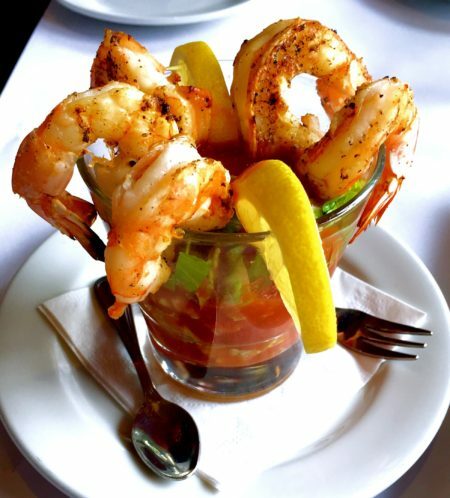 The food was delightful, presented beautifully, and service was perfectly wonderful. The only ‘issue’ we had during our initial visit was deciding what to order from the incredibly creative, expansive menu. (Not a bad ‘issue’ to have if you ask me…!) There were so many dishes on the menu we wanted to sample, from creative appetizers, to delicious entrées, to succulent dessert options. Chesapeake Bay Sea Scallops with mashed potatoes, wilted baby spinach & roasted Brentwood white corn salsa. Oh yes, and the infamous Spiced Pear-tini…!!! On a final note, usually we visit a restaurant several times prior to creating our thorough restaurant reviews. However, in classic Le Voov! fashion, we felt it was more important to share our discovery, than keep it a secret! We decided to break protocol and provide you with an ‘initial review’ of The Peasant & The Pear, with the promise of a more extensive review coming soon. We plan to return to further explore the lunch menu, as well as the dynamic, mouth-watering appetizer, dinner and brunch selections with vigor! Please visit the Le Voov! Restaurant Review page again soon! Le Voov! Tips: Reservations are a must! (Thankfully, they use Open Table!) Given the fine-dining environment and close seating, it would not be the best choice to bring small children, though the kid’s menu does look enticing!